We at the DCEDC are elated to be bringing back the highly popular High School Home Construction project for the 2017-2018 school year after a couple year hiatus. 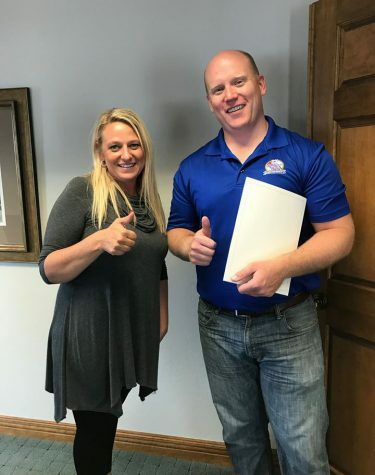 We closed on the purchase of the lot today (DCEDC Executive Director, Caleb Frostman, and Holly Tlachac from Peninsula Title pictured here at the closing) and will be starting construction within the first couple weeks of the school year. This program has been wildly popular over the years as an on-the-job, hands-on educational experience for our youth. This year, a dozen students from across the county will be working under the instruction of Seth Wilson of Sturgeon Bay High School, as well as a number of participating contractors from the Door County Homebuilders Association, to build a single-family home here in Sturgeon Bay. Stay tuned to Facebook for updates and great photos as the home progresses.